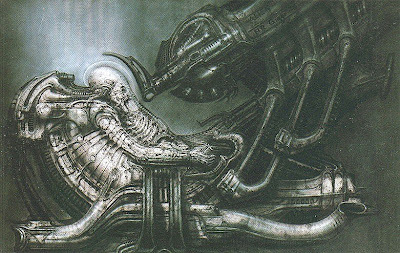 Giger came to design the space jockey once Ridley Scott decided that Giger would handle all the Alien environments rather than just the alien race on the planetoid and the egg silo and then Ron Cobb would design the human environments. A basic thought behind the space jockey connected with the presence of a bone settee in Texas Chainsaw Massacre where the human skull was positioned in the centre on top of the back rest and the arms along the arms served as the arms of the piece of furniture. It was an example of something very strange and interesting, but the design for their space pilot would have to be something much more complicated. 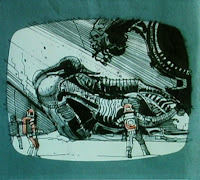 Moebius did a drawing of the Space Jockey for Ridley, that showed a head based on a sketch by Chris Foss. 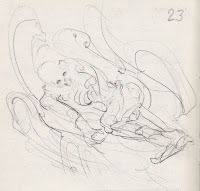 The work appeared to have not been completed before Moebius decided to leave within two weeks of arriving. 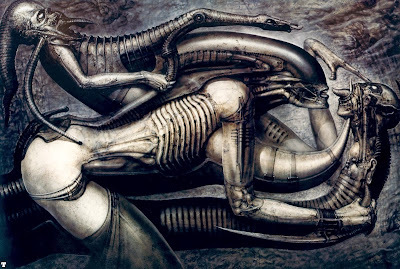 Ridley's storyboard showed a creature inspired by the painting Necronom V by Giger, that looked liked the bare remains of a fossilised creature with some humanoid features, and its seat was the back of the female seated figure bending forwards as if riding a motorbike, that it had been piercing into. 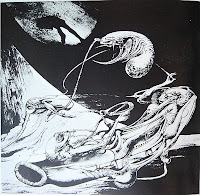 Soon the entity evolved into something that was done much earlier in Giger's career during the 1960s, when he was drawing ink drawings showing humanoid with pipes coming from the face and also with hands on handlebars which are popular reoccurring image in his works. At some point in time, the Henu Barque entered into the design of the space jocky seat and telescope. c) Assembling the ideas for the Space Jockey. The idea started with a chair that swiveled up and down with the telescope resembling a bird of prey's head with a sharp beak pointing down towards the pilot. 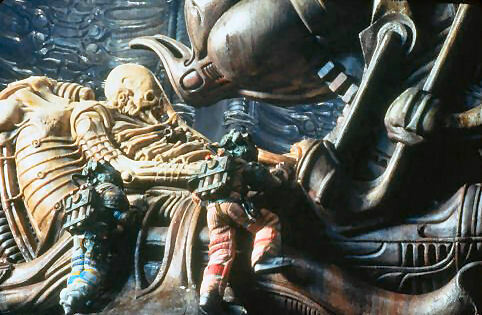 Giger reworked ideas from Jack Kirby comic books, such a Celestials flying around on a hover sledge and the giant statue of a Celestial in his mini space vehicle in The Eternals. There was the shock chair and suit from S.H.I.E.L.D. A turning point came when they decided to go along with the Henu Barque (also known as the Sokar Funerary Barque) from the Egyptian book of the dead. 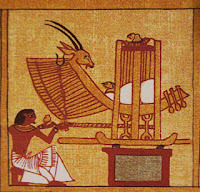 Ridley would them have taken note of the image from the Egyptian book of the dead and got Giger who knew about it to integrate it into his Space Jockey design. The presence of the image at the Grauman's Egyptian Theatre in the past would also have helped to make the thing seemed significant. The pilot in his chair would evolve to look more and more like the Henu Barque. 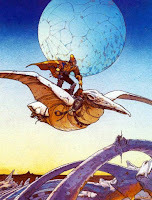 One might consider Arzach sitting on his giant bird by Moebius as a significant point of reference, with the head of the bird transforming into the telescope, and this would also have been merged with the Salvador Dali's "Martian Dali equipped with a double holoelectronic microscope" that Chris Foss had earlier referenced in a drawing for a closeup of the derelict ship. Meanwhile the Dali illustration appears to reference a late 1800s illustration for the cover of the book " Les Exilés de la Terre" by André Laurie. 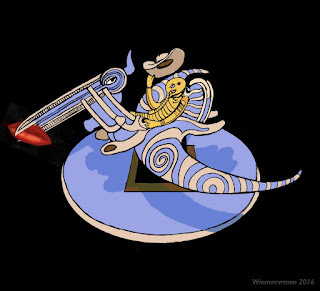 Then from the upper front, the telescope has a mouth that perhaps references the lips from Dali's "Mae West's Face which May be Used as a Surrealist Apartment," with the back of the pilots seat transforming into her nose. 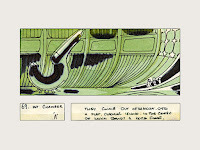 Giger was interested though to keep the design as simple as possible from the outside in terms of what they did technologically in near enough the manner that the monoliths from "2001: A Space Odyssey" were possibly housed complicated machines inside but were simple in form on the outside. 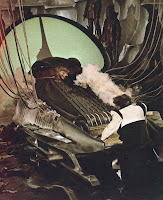 The design of the "Excessive Machine", in the film Barbarella, that resembled a sort of a sleigh complete with runners stuck in the centre of a giant chamber like the interior of a whale as seen in Pinocchio cartoon film, appeared to have made its way unconsciously into the design, since it made a significant impression. 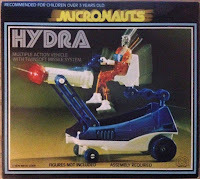 6) Micronauts Hydra referenced in Space Jockey? 8.) 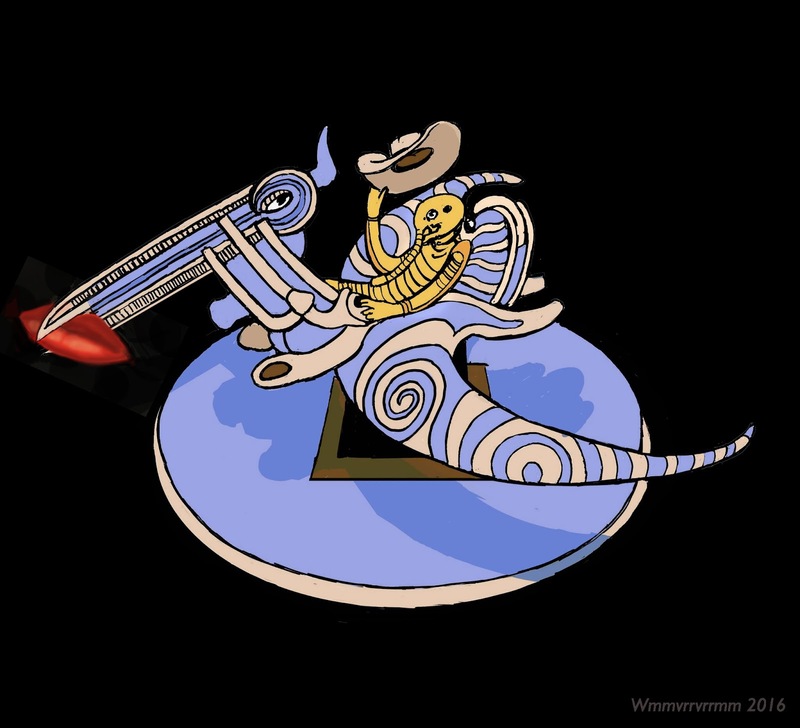 "Martian Dali equipped with a double holoelectronic microscope" inspired the telescope ? 9.) 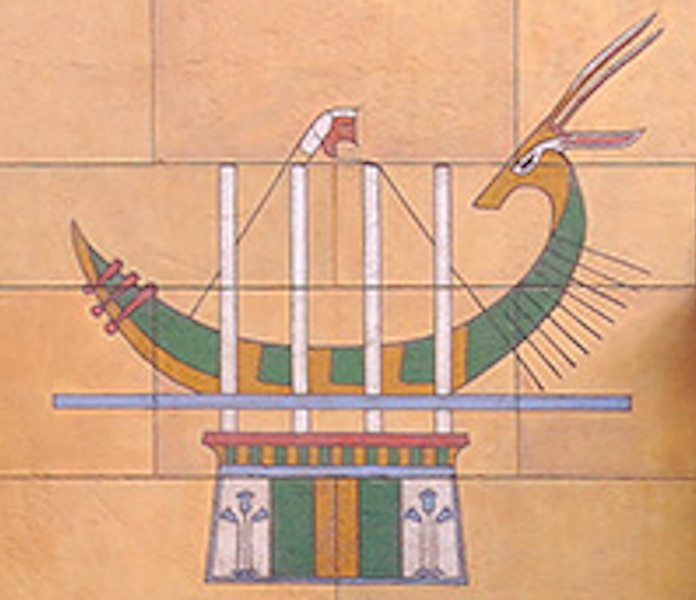 Front above view of Space Jockey chair and telescope references Dali's "Mae West's Face which May be Used as a Surrealist Apartment," (1934-1935)? 11.) Evolution of the Space Jockey via the Waiter's Friend / Sommelier knife ? 14.) Space Jockey seat references Celestial on hover sledge in The Eternals #7 ? 15.) Alien: Space Jockey design references anti-shock seat from Jack Kirby illustration for S.H.I.E.L.D.? Regarding your fifth paragraph, is the detail of the Necronom IV, not from the bottom left, but just the top of the image? Thanks for the observation, I'm going to correct it when I work out what I am talking about in relation to the image. This page has since been broken down into headings leading to various pages with different sections about Giger's space jockey's design evolution. awesome blog! i've been looking up search engines for some information from the alien series. keep up the good work!